Former Vice-President, Atiku Abubakar has revealed the possibility of holding talks with his former boss, President Olusegun Obasanjo, is not ruled out as he bids to become president in 2019. 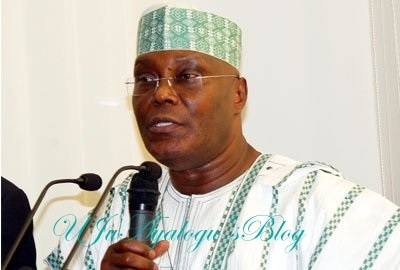 While speaking on behalf of his principal during a telephone interview with a correspondent in Abuja on Sunday, Mazi Paul Ibe, a Media Adviser, said that Atiku Abubakar has not ruled out the possibility of holding talks with his former boss, Olusegun Obasanjo, in pursuit of his political ambition. The former vice president's spokesman who spoke in reaction to the advice given by former President Goodluck Jonathan, explained that Atiku, a master of consensus building, would not discountenance the importance of carrying everyone along. Jonathan had, in an interview, described ex-President Olusegun Obasanjo as “the boss of bosses.” He had advised the former vice-president to reconcile with Obasanjo in order realize his political ambition. Meanwhile Atiku met with PDP leaders as the News Agency of Nigeria reported on Sunday that the former number two citizen had met with members Adamawa PDP executive at all levels, as well as state chairmen from the six states that made up the North-East. It was gathered that Atiku had been meeting with leaders of the PDP and have alsp met with the PDP national vice-chairman in the North-East.